A WOMAN DELIVERED A SNAIL. What is this mysterious thing? You can't touch it but it affects how you feel. You can't see it but it's there when you look at yourself in the mirror. You can't hear it but it's there every time you talk to yourself. It affects how you think, act and relate to other people. This thing is a breathing and living organism inside of you. It is quiet knowing that you are priceless. You cannot go and purchase it. What is this mysterious thing? This thing affects your potential to be a successful person. Sometimes when we look at the life we are living, it sounds so cruel and bitter, living in a world where people cannot dictate their directions and well being, it is really hurt. People see reality as a doom of spiritual spells and attack. With all the changes and experience we get each day, some people still live their life by traditions i.e. things of old. But they are forgetting that everyday counts in our life as we grow. It was on the 6TH Dec 2009, l saw what eyes have not seen before in my life at The Synagogue, Church of All Nations on a Sunday live service telecast on EMMANUEL TV where a woman delivered a snail in front of a large congregation, It may sound surprising but it's true. All this started when the man of God, T.B Joshua was praying the closing prayer - that is when the snail dropped from her body. Mrs.Febisola Ajakaye had been complaining of a moving object in her stomach as a child with hotness inside the stomach and she had not been seeing her menstruation for three horrible years. She further complained of nightmares, that she always dreamt seeing the dead and seeing herself in the midst of them. A doctor even confirmed no pregnancy and a native doctor (herbalist) told her that she was going to die because she had been tied down by enemies. But God Almighty never placed her in any word of curse but a word of restoration to her real self through his servant, Prophet T.B Joshua. Then the question that was still going through many people's minds is: how did the snail get there? All these questions and many others relating to the stone are regarded as a spiritual matter, which ordinary men cannot comprehend or explain. They are beyond human comprehension. 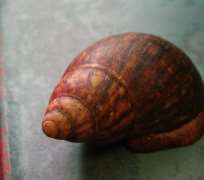 Even if the woman was operated in the hospital, that snail would still be invisible to the doctor. The woman might have visited so many hospitals and herbal homes without a solution. But the Bible says, “With God all things are possible”. God was able to deliver the woman through his Prophet T.B Joshua and he was still able to deliver many of such women yet to be discovered.